Why is it we are often encouraged to get out of our comfort zones but rarely encouraged to get IN our comfort zones? Well, that’s what I’m encouraging you to do during this holiday season. Get IN your comfort zone. Shouldn’t it be about balance? If you’re going to stretch outside your comfort zone, which you will as a Warrior, then it needs to be balanced with being in your comfort zone. What better time of year than this season of tradition, celebration and comfort food. Join our community Facebook group, Creative Warriors Unite, at www.joinwarriors.com and share your feelings and continue the conversation. My book, LINGO: Discover Your Ideal Customer’s Secret Language and Make Your Business Irresistible is now available! Have Your Website Brand Message Reviewed! Is your website and are all your marketing materials speaking the right LINGO of your ideal customers? Often it’s not which is why you’re not converting traffic and leads to clients and attracting your most profitable customers. Fill out the simple LINGO Review application and I’ll take a look at your website. If I have suggestions for you to improve your brand message (I almost always do), we’ll set up a complimentary 30-minute call to discuss. A select number of websites are also chosen for my LINGO Review Video Series. Fill out the application today and let’s get your business speaking the right LINGO! 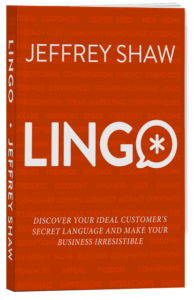 In LINGO, serial entrepreneur, business coach, and host of Creative Warriors podcast, Jeffrey Shaw reveals how to make your business irresistible to your ideal customers by speaking their Secret Language.